Highlights: Lends a very wonderful and mystical feel to the beach while providing a spectacular view of the sea. How to Reach: Chapora fort can be easily reached by hiring local transport from Mapusa or even Panaji, which is 18 kilometers away from here. Located on the Anjuna beach in Goa, the Chapora fort is one of the most popular tourist attractions of India. This massive fort is built out of red laterite stones and was constructed first by the ruler of Bijapur, Adil Shah. This is one reason why it has been named Shahpura, which means the 'town of Shah'. The Chapora fort is located at a distance of around 10 kilometers from Mapusa and can be reached by hiring a taxi or an auto from Mapusa. One can also take buses from Panaji that ply to Chapora fort on a regular basis. 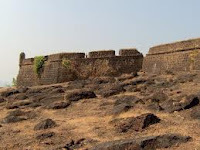 The Chapora fort was built essentially to keep watch on numerous Hindu raiders and plunderers who came to establish their territory through Goa. The fort was destroyed after the rule of Adil Shah and was rebuilt by the Portuguese around 1617 when they made Goa their colony. The Portuguese also deserted the fort around 1892. During the Portugal rule, the fort was built in a grand style and also had underground tunnels to aid in escaping in case of an emergency. After the Portuguese left, the fort was abandoned and never occupied again. Today, though mostly in ruins the fort gives a spectacular view of the Vagator and the Anjuna beach. Many people who come to the beaches visit the Chapora fort just to feel that mystical air and view the sea from the ramparts of the fort. The walls are still strong and have withstood the lashes of time for many years. The Chapora fort is a very popular tourist attraction of Goa and many tourists don't go back without visiting the Chapora fort at least once.